“At the end of the day, there is a shift happening where folks have to measure what engagement really means,” says Tristan Walker, director of business development at Foursquare. “What is an impression worth? What is a click really worth?” And what about a check-in? AmEx and Foursquare are going to answer that question. Today Foursquare announced a nationwide partnership with American Express to offer discounts to cardholders when they check in at select merchants. Now, after linking your AmEx card to your Foursquare account, you’ll be able to earn special offers at certain retailers and restaurants: Spend $75 at H&M, for example, and you’ll get $10 back on your next statement. There’s no longer the need to wave your smartphone at the salesperson–after checking in, deals are synced to your AmEx card directly. For Foursquare, which recently hit 10 million users, the big-name partnership is yet another sign that the startup is a force to reckon with, even as other big players like Groupon, Google, and Facebook enter the discount space. But more importantly, the partnership might finally give us some hard evidence as to whether social media is a worthwhile investment for merchants and marketers–or whether it’s an overhyped trend for the time being. In our latest issue of Fast Company, contributor Farhad Manjoo examined whether social media actually has a return on investment. The conclusion, he finds from speaking with startups such as Klout and Wildfire Interactive, is less than reassuring: It seems few if any companies can say with confidence the impact social media is having on their bottom lines. It’s an issue that has plagued even huge players in the space like Groupon, which critics have knocked for providing little long-term gain for merchants. 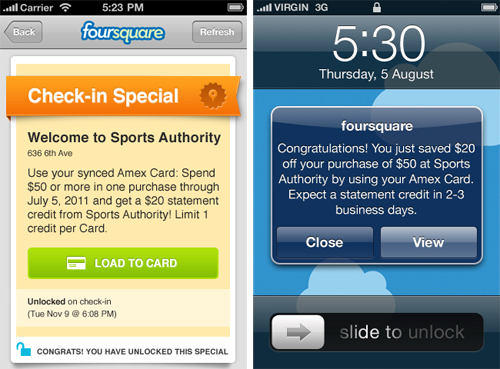 Foursquare aims to help merchants foster customer loyalty. Loyalty, Walker says, is measured in recency, frequency, and value. “We’ve nailed the recency and frequency with check-ins: Who is checking in when, how often, and with whom,” he explains. With American Express, Foursquare hopes to solve the last piece of the puzzle: Showing merchants the value of social media promotions with hard data.